Lately, I having been playing around with multiple projects, sometimes I get more done when I am unfocused. I recently received a larger shipment of Front Rank and Calpe figures, for the start of my Prussian project, but in that shipment were some Austrians as well as my first limbers and caissons. I am still experimenting with Austrian white uniforms and Army Painter and I have finished one of 4 limber/caisson sets that I received. I will put some photos up when all 4 units are done. 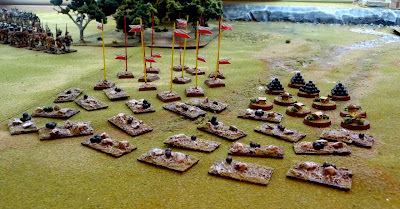 In the meantime though, mostly because I am just not ready to start the Prussians, I have been playing around with wargame playing aids. Generally, you need some way to mark casualties, unit status and the fire status of artillery and infantry. None of markers are original, I got the ideas from other blogs and TMP. I had been using coloured paper chits and cotton wool, I was really keen on neither. I have been using 20x40mm bases for casualty markers, these are the same size of my infantry bases and what I do is add one to the affected unit when they suffer a casualty, as you can see each has a different numbers of cannon balls (bb's) to make the loss of Unit Integrity etc, I find this works quite well and looks quite tidy. I may add some casualty figures to the same size bases with the cannon balls, when I get some. I understand that the Perry cavalry have multiple casualty figures in their boxes. To measure unit status: Disorder, Rout, etc, I am using flag poles with different coloured poles and the pennants placed at different heights. For Field of Battle, only 2 indicators are required. Here I represent disorder by a yellow pole and an high pennant, and rout by a red pole and a lowered pennant. If I play a game with a third state, I shall use another colour with the pennant at 1/2 staff. I used 20x20mm Citadel bases with a lances from Foundry stuck in the base. I then terrained the base in the usual fashion. 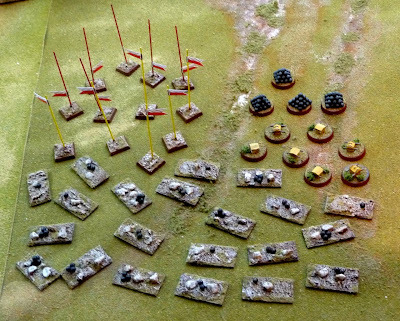 For fire markers, I used pyramids of brass bb's for artillery markers on 20mm diameter round Citadel bases and ammunition boxes for infantry on the same bases. The bases were painted and flocked. I place one of these markers on a unit when it has been fired. I believe they all came out pretty well, and am happy with the result. The last thing, I have been recently doing is trying to do a small trial scenario of Republic to Empire. I find the writing in this rulebook quite dense and I am having some difficulty getting even the first move made. I admit that I am quite new to wargaming, but I found the the writing in Lasalle, Field of Battle and Le Feu Sacre quite clear and I could easily play a game after 1-2 read throughs. I am not going to throw in the towel yet though, as the rules appear to be quite interesting. Position in Turn 1, French with MOVE orders after a 16" advance and 4MP. Colonel Tiff believes the French should be allowed to immediately attack!! I like Colonel Tiff! Where did you get the rivers from? As you are expecting a load of Calpe if you drop me a line I can give you some tips to help you paint the Calpe quickly using either AP or inks. I made the rivers myself, if you click on the terrain tag on the blog 1 of the entries details the method. I have the Calpe now, I am all for quick you can get me at johnamichael at gmail dot com I would love to hear your method. La colonel is very rough with the men.